Vacation rental house. 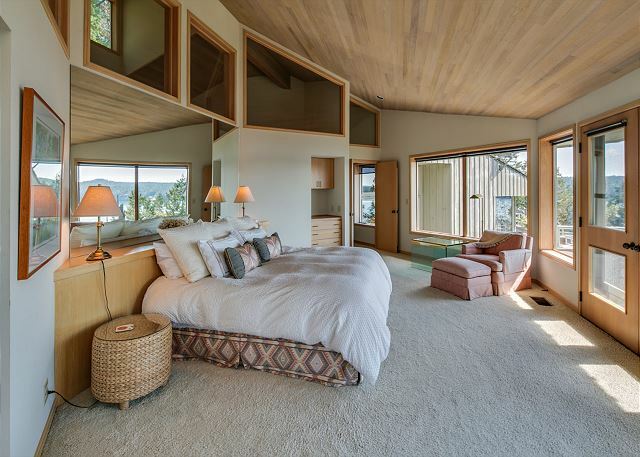 Sleeps 8, 3 bedrooms, 4.5 bathrooms. No pets allowed. Welcome to Isle of Sky! This is a gorgeous property surrounded by the incomparable beauty of our Islands. Along the patio in front of the property are a number of beautiful settings including this wonderful spot to dine and watch the boats below. You will have magnificent views of distant islands and passing boats. 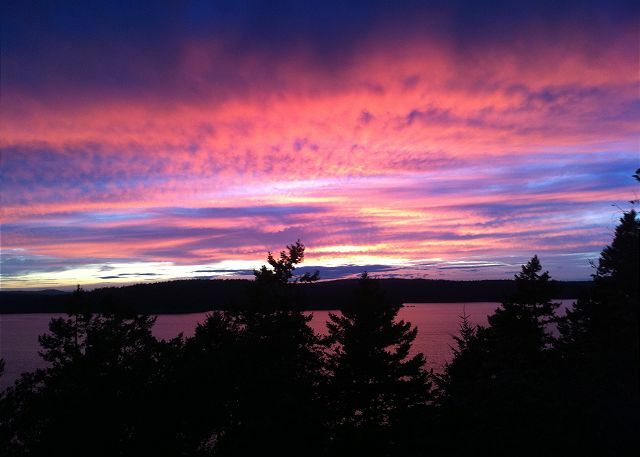 No matter the season, Isle of Sky enjoys glorious sunsets all year long. The scale of this beautiful home can be appreciated by this drone shot from over the bluff. One last view of the deck before moving inside; tables and chairs offer multiple spaces to enjoy a gorgeous island morning, or to relax in the evening when it's time to slow things down. Welcome inside! 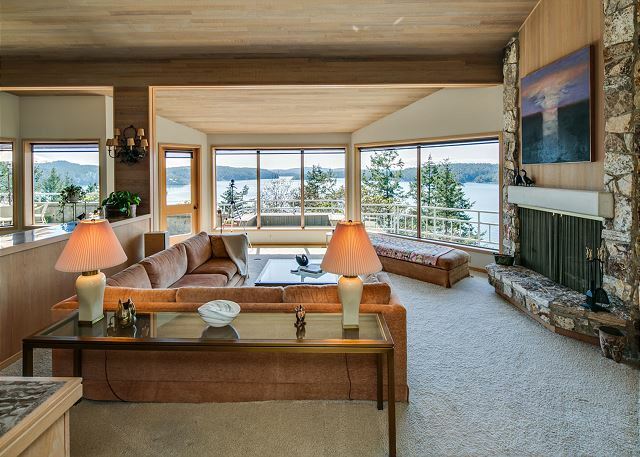 The main living room has a grand piano, fireplace and large windows to enjoy the view. This is what classic island design is all about. Another view of the living room. Regardless of direction, you can enjoy the view from almost any viewpoint. Another photo of the living room area. The grand piano adds a beautiful touch of class that this home deserves. The kitchen is modern, well equipped and very spacious. Do you have any friends that like to hang out IN the kitchen while you're trying to cook?? Not a problem here! Another view of the kitchen area with the sitting room in the background. A fun bar height counter space provides a great nook for kids or adults. A great sitting area to enjoy a movie, game, or fire. An additional shot of the sitting area between the kitchen and dining room table. Big views from the dining room table. A formal dining room is also available for larger meals or evenings where this type of setting is more appropriate. A different perspective of the dining room and step down living room. 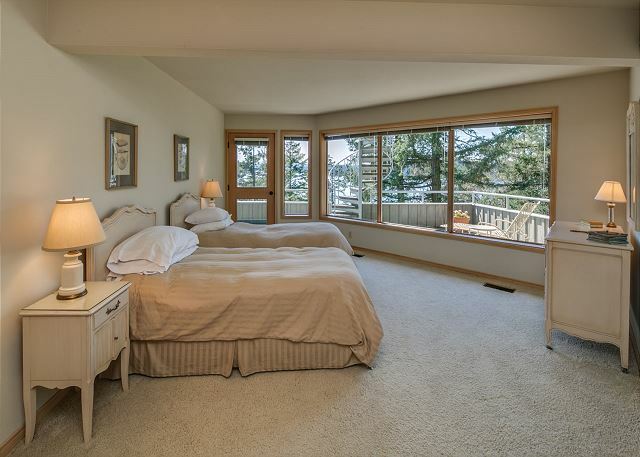 A spacious and cozy master bedroom with walkout doors accessing the deck provides a wonderful, welcoming setting. A second view shot from the master bedroom looking back the other way. 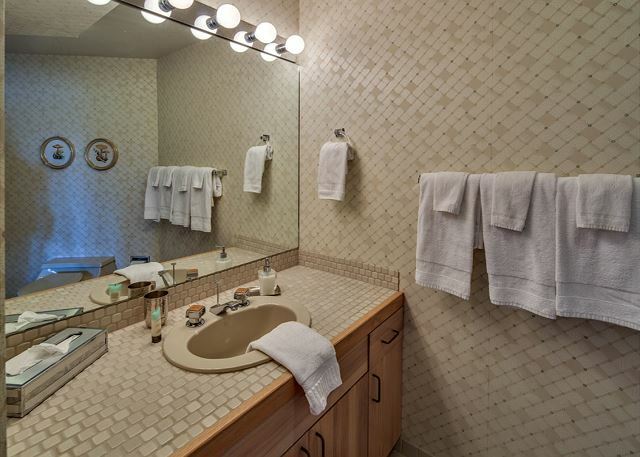 A spacious master bath adjoins the master bedroom and provides a great space to enjoy a morning soak. 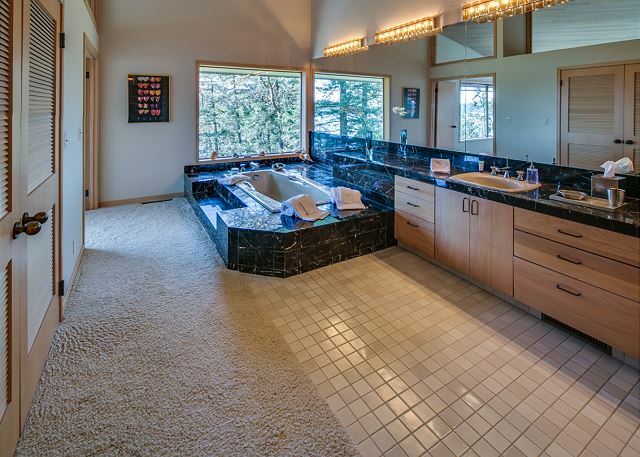 The spacious master bath from another angle. A guest room with side by side beds offers your guests the same comfort you expect for yourself. Cozy, well appointed...now get some rest! Another view of the guest bedroom from a different angle. 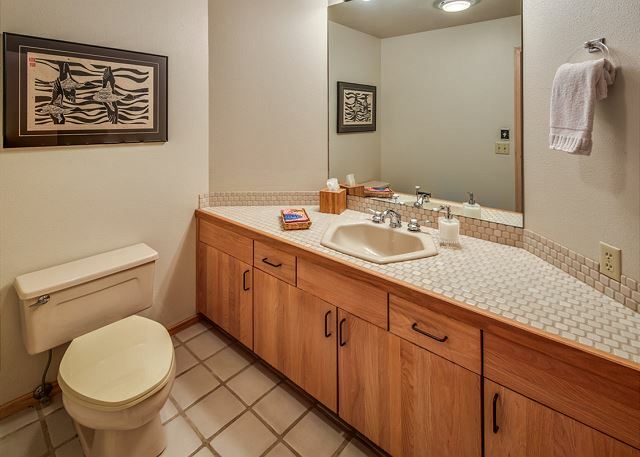 The guest bathroom is comfortable and well equipped. Another guest room has access to the porch. A second view of the guest bedroom. A third guest bathroom. Hey kids don't fight, you each get one! High quality washer and dryer for guests who stay longer and may need to do some laundry. A view of the hot tub and lower deck. 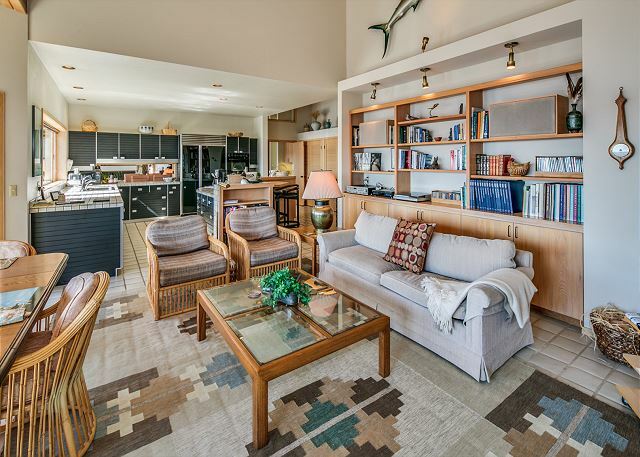 Isle of Sky offers everything the discriminating traveler looks for in a vacation home with classic island decor. 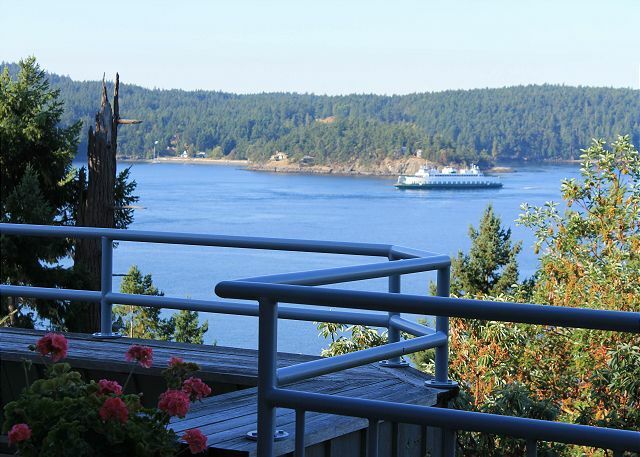 We think this last shot may do the trick, ferries pass by right in front of the house! Come enjoy the magic of Isle of Sky. We explored and hiked beautiful Orcas Island. What a wonderful home base to return to. This totally clean and perfectly outfitted home sits at the top of a cliff which descends to the ocean below, breathtaking! 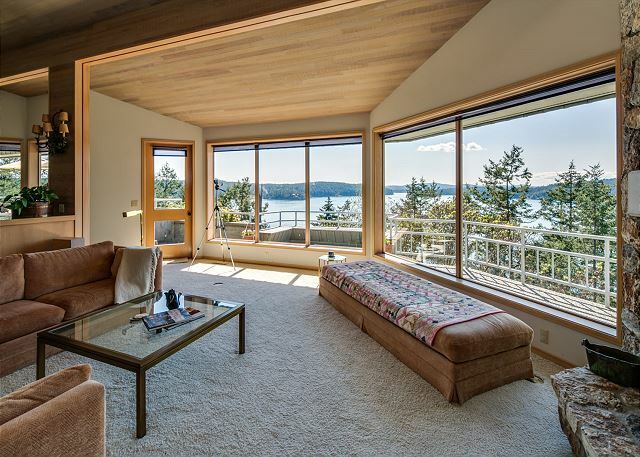 We enjoyed the view and immaculate condition of this large home. It provided space for three generations of our family. It is the best equipped kitchen we have encountered: room for three good cooks! This was our second stay at the Isle of Skye home. It is a lovely house in a great location with wonderful views. This house is really spectacular. So much indoor and outdoor space! And everything was beautiful. The only critique that I can think of is that the water pressure was really, really low. There were many showers, but in all but the master bathroom, we could not get more than a trickle to come out of the shower head. However, that did not get in the way of our enjoying this house a great deal. We would absolutely come again! We visited in early June with our three young adult children. The house was amazing with spectacular views from every room. It was even nicer than in the pictures. The house was 5 minutes from the ferry, but peaceful and secluded. We wanted to cook at home and the house was equipped with EVERYTHING you could possibly require. 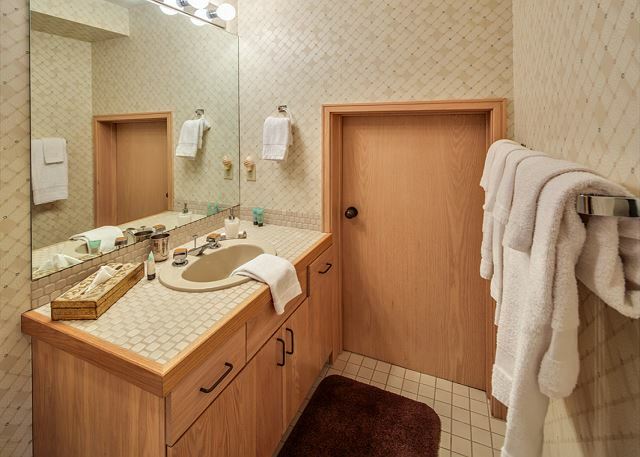 There were also many nice extra touches such as beach towels by each of the bedroom doors for use on the decks or spa. The management company was also great and promptly responded to my emails prior to the trip. Gorgeous views from a spacious, lovely home. 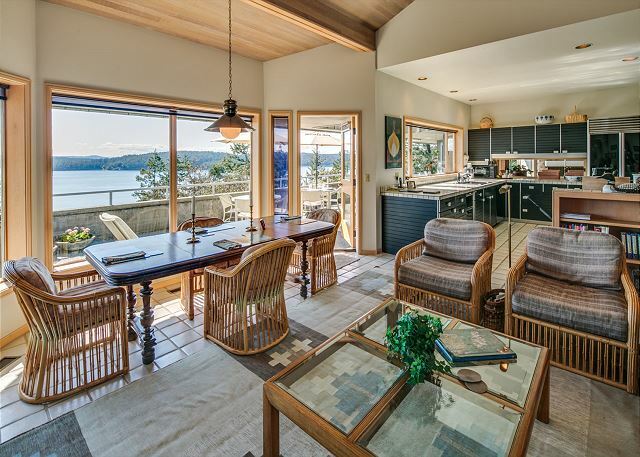 The house has soaring ceilings, fantastic views of the water, and a well stocked kitchen. 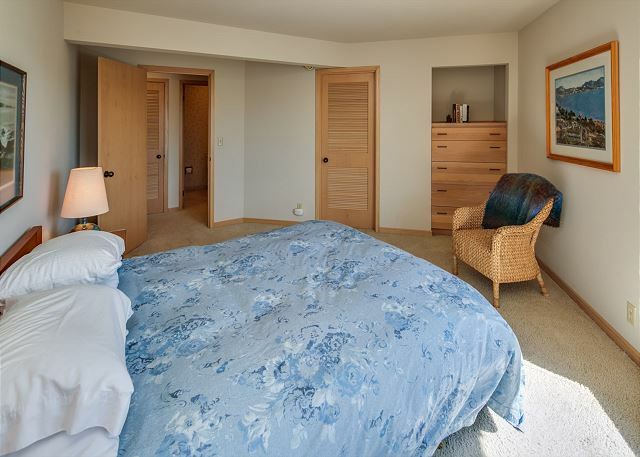 The master bedroom is huge with a very comfortable bed. There are games, books, music, and helpful instructions from the owners. 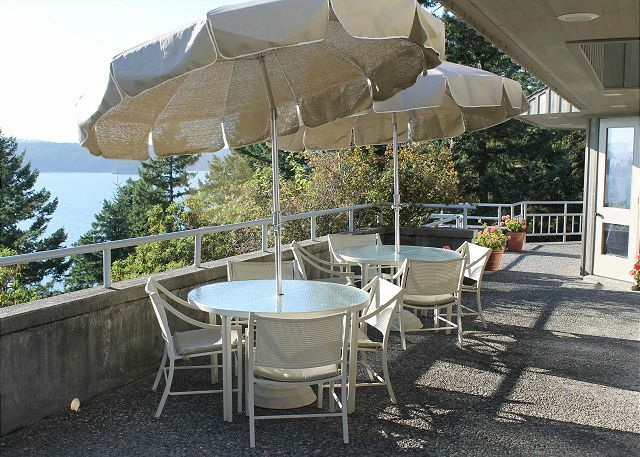 The location is minutes from the ferry, but quiet and secluded. This house is fabulous. There were 6 of us and we all loved our stay. There was so much room we all had plenty of privacy. The house is equipt with everything you need. The property and the view are stunning. We hope to come back again! 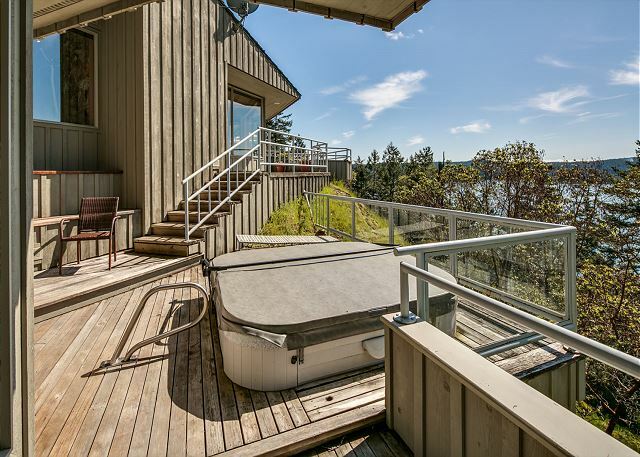 the house sits high and overlooks the water with wrap around decks. the setting could not be improved. the house is large and comfortable with many amenities and comforts. A beautiful place to enjoy nature. it is approx. one mile from the ferry landing and about 15 minutes from the town of Eastsound. We loved the house! It was so lovely and open. The deck was incredible as was the view! Breathtaking. The hot tub was relaxing and the kitchen was so well stocked with dishes/serving pieces. It was like being at our own home. So very comfortable. My nephew and niece even played the piano. We were happy to help with laundry so the housekeepers could prepare the house for the next guests. We would definitely return for another visit. Liked being close to the ferry station and did not mind the easy drive into town. Thank you to the owners for sharing their lovely home with us. Orcas is a magical place. We had a terrific stay. The gorgeous photos didn't do this property justice--it's even better than that. Stunning views from every angle of this well kept house with amazing spaces for entertaining and gathering together. Perfect location less than a mile from the ferry. Quiet, peaceful, restful...PERFECT. We hope to be back!!! Home is truly fantastic. AMAZING views from almost anywhere in the house. Would highly recommend for a family. The property had excellent views from all windows and decks. The interior was very comfortable and was well stocked with everything we needed. We enjoyed the stay and would return. 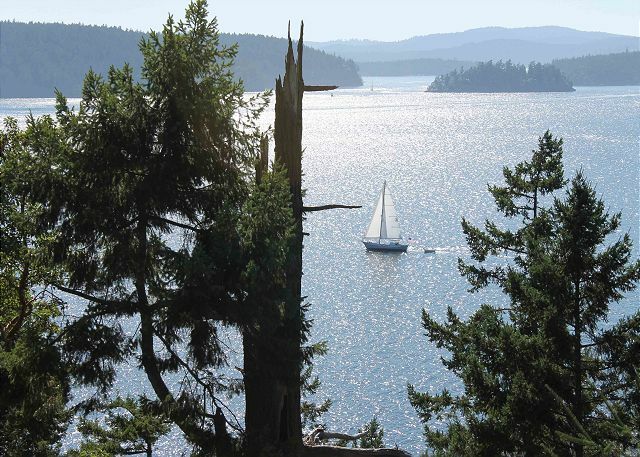 Our family of five adults found this a wonderful home to return to after each day of exploring Orcas Island. The house is situated beautifully and it's completely equipped with every amenity. The House was terrific. Very beautiful views, comfortable beds, great location! 5's all around. Perfect for our extended family. The young girls loved the hot tub. There were eight of us gathering for a mini family vacation on Orcus Island. Isle of Sky was a beautiful place to stay and enjoy together. The home is clean, large, beautiful and the view is stunning. Being able to enjoy the hot tub under a sky full of stars was icing on the cake! 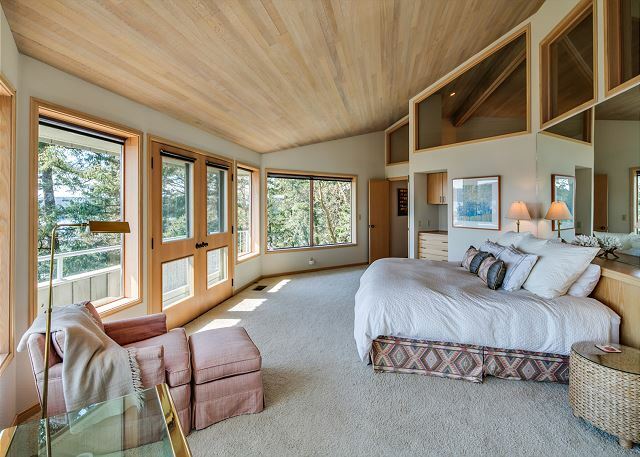 The master bedroom is huge. The only down side was not having a 4th bedroom in a 4000 sq/ft house. The rollaway cots are comfortable but there is no private place to put them. That being said, my son and his wife put them my the large living room windows and fell asleep each night watching the shooting stars. This was by far the best "home" we have stayed in during a vacation. We love to cook and this kitchen is better equipped than ours. Every detail has been well thought out, music, books and the views - spectacular! As early risers and hikers the location was great as we then choose to cook in and relax. I would stay at no other property having had this experience. Beautiful house with spectacular views! My only regret is that the home was not for sale! The house was gorgeous, immaculate, beautifully furnished and in a lovely location with every desirable amenity and detail provided. We thoroughly enjoyed our stay with one big exception: the mattresses. The master suite bed gave the occupants a backache and the downstairs double had a serious sag in the middle (not suitable for two people). The twin beds were OK. Also, with one of the two downstairs toilets not working, the bathroom situation was not as convenient as expected. Check-in was a bit delayed because the cleaners were overwhelmed with several large houses that day, but they scrambled and we made it to our dinner reservation--no problem. I'm sure the toilet has already been fixed so if the mattresses are replaced, it will be perfect! On that condition, we would highly recommend it! 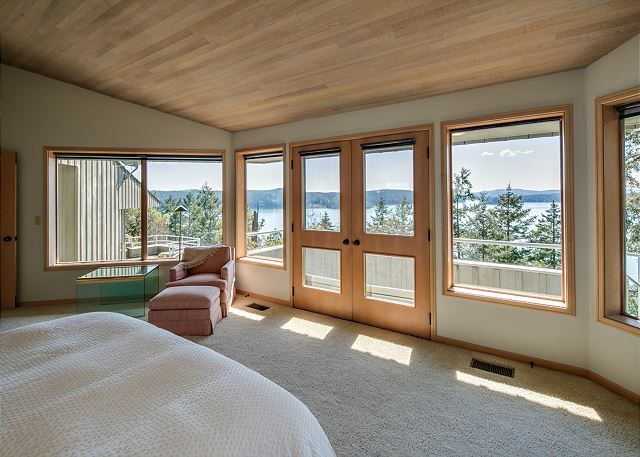 This home is great with an amazing view from almost every corner of the house. It is quite large but cozy at the same time. We loved our week at the Isle of Skye. We had a few resident deer that visited us in the afternoon. The only problem was one of the downstairs toilet did not function properly. I attempted to fix it myself without success. I called property management and reported the problem believing that someone would come and fix the problem, but that did not happen. It was a minor inconvenience but it is something that should have been attended to especially since there is a water shortage on the island. Water pressure is a problem also but not the fault of the property, it is an island issue because of the pumping stations that the water company uses. Overall, this is a five star home and experience. 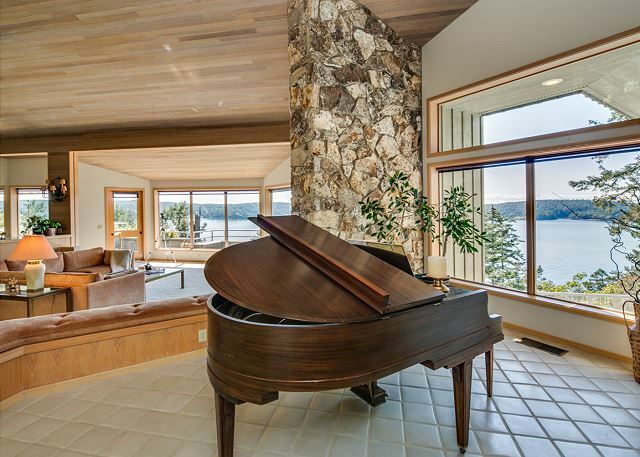 Great view, great spaces, great piano, great comfort and great memories. Beautiful, huge home. Great kitchen, den, and bedrooms, which is where we spent our time. Very, very good location and views. I'd go again. We came prepared for rain. In 4 days it did rain 1..all day. We went grocery shopping and cooked in with a fire burning and music playing, oh and some wine also :-)). We set up the mahjong and had a marathon for about 3 hours. The sun came out and off to Deer Harbor for sea kayaking from 2-5pm. Extremely recommend doing that. 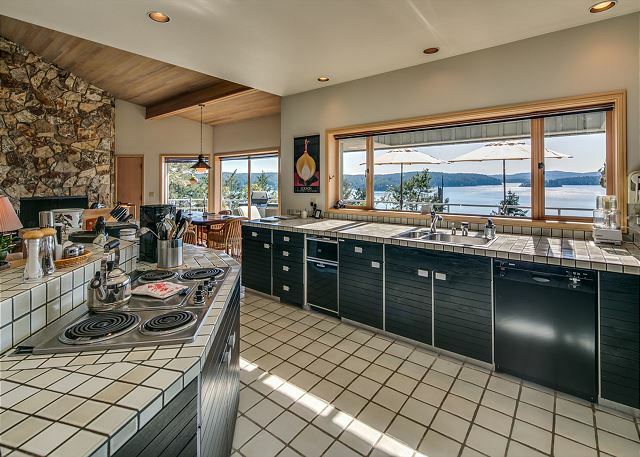 This house has a kitchen to die for!! Everything you could need to cook is there. I wish we would have had more people to entertain, the table seats10 or more. Spices are there as well as flour, sugar etc. We will be back someday. Fantastic home and outstanding location. Very nicely furnished. Couldn't have been more pleased. Five stars all the way around. Our family had a wonderful time on the islands. The accomadations were wonderful and could not have been better. We will be recommending this home to others. 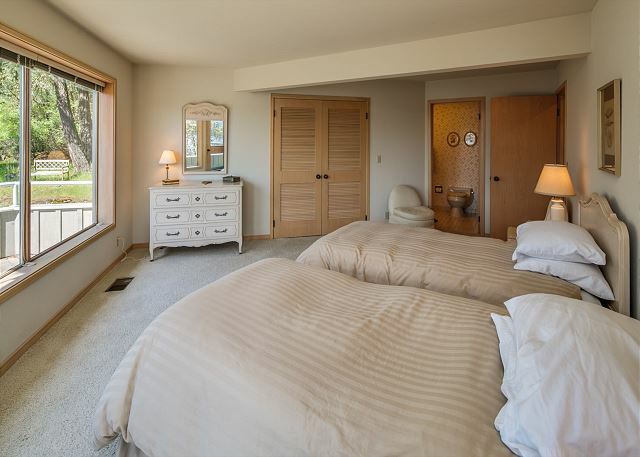 This house offered a wonderful private setting for a relaxing and enjoyable vacation. The house was spacious, well maintained,and came with a amply stocked kitchen. The views throughout the house were incredible. 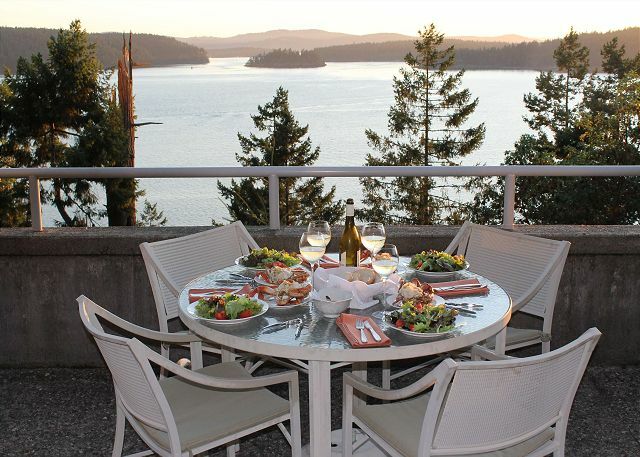 The large grill was put to good use during our stay and we spent time enjoying our meals on the deck. The hot tub became the last stop of the night for the family as the beautiful sunsets turned into nightfall. We look forward to coming back to this spot. The only thing missing from this house was a walkway/steps down to the water but we understand that this was not a part of the original design of the property. The photos of this lovely home simply don't do it justice! It has an incredible view from EVERYWHERE in the house. 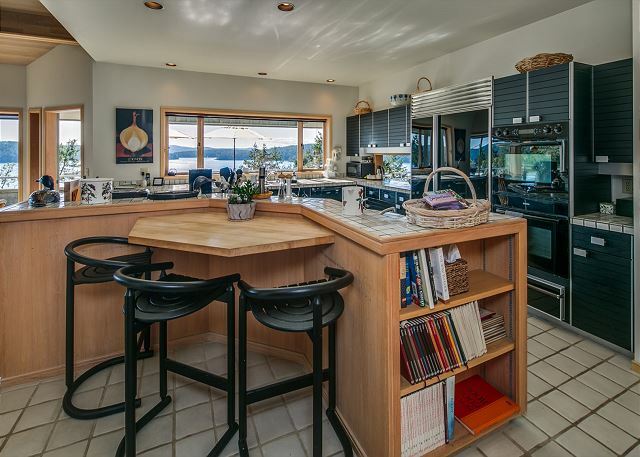 Every detail of the house is exceptional from the massive windows in every room to the hot tub on the deck and a wonderful kitchen that made it such fun to cook diners at home and enjoy the sunset!! The Management Company was quick to respond to phone calls and questions and they made our stay a wonderful experience! Thanks!!!!! Very nice home with an incredible view. Everything was well stocked which made it very easy to relax and enjoy our time there. A beautiful quiet home perfect for three couples!! We all loved cooking together in this gourmet kitchen for Thanksgiving. It had all the pot, pans, gadgets and cool stuff that us cooks love! Thanks for sharing your home. The house is even better than the pictures. It is an enormous amount of space, perfect for groups of 4-8; and you will still have room to spare. 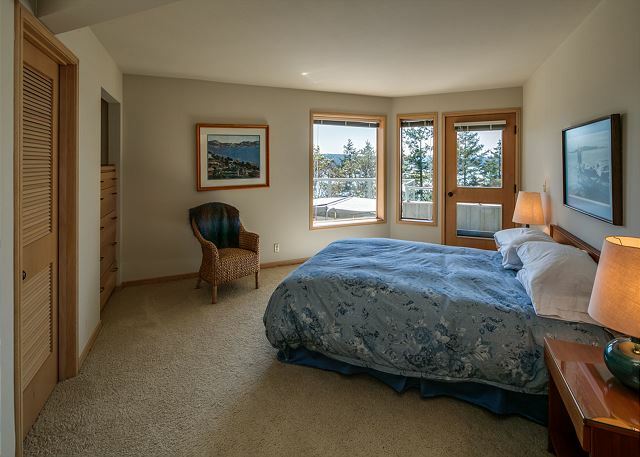 You have panoramic views from each room and having the hot tub with those views after a long walk or hike was sublime. Plenty of room on the deck for cocktails and dinner. While I have no complaints, it would be great if the house has more materials specific to the Island - such as trail info and maps, recommended kayak/horseback riding companies, recommended things to do (off the regular tourist path) home service masseuses. Ofcourse we were able to figure it out on-line and with the local COC but it would be nice to have the "insiders view" info there as well. beautiful, luxurious house with a magnificent view not very centrally located, but with a car no problem. Our extended stay at Isle of Skye exceeded our expectations, and afforded a a delightful escape from the south Texas summer heat. The house is impeccably furnished and maintained, and its owners and management team were gracious and accommodating. 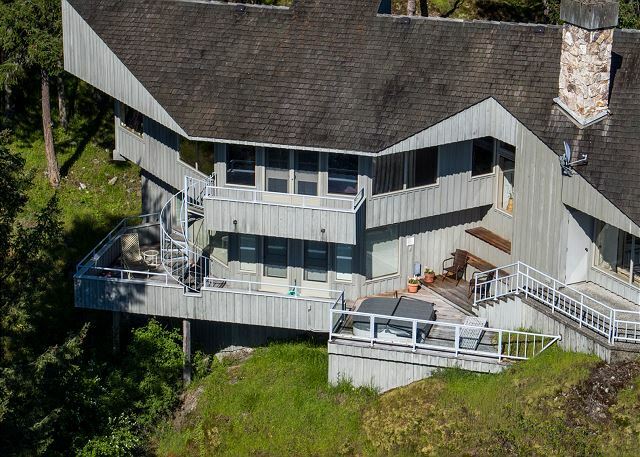 This is a beautiful house located on the west facinf slope about 1/4 mile from Orcas Village. The evening views from the outside balcony were breath taking. We enjoyed watching the fireworks over Deer Harbor visible from the balcony. My complaints are that the internet or modem seemed to go down quite often, the clothes dryer makes a terrible racket when operating, and the house has a musty wood smell (likely from all of the beautiful custom wood panelling). Other than these minor issues, the stay was memorable! We're glad you had a good time. Thanks for letting us know that the internet is intermittent, we'll investigate. The dryer has also just been replaced. Just a word of advice: you need better knives for cooking and a nice can opener. the view is amazing. The Island it wonderful and we will be back. Very nice...private and a beautiful setting. Great for large groups. The home was awesome and we are staying at the home again.